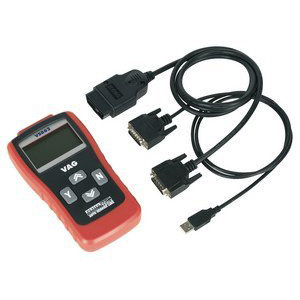 The Sealey VS862 VAG code reader, diagnostic tool is a hand held, stand alone unit, designed to work with Audi, VW, Seat and Skoda vehicles equipped with Controller Area Network (CAN) protocol.. Very simple to use with a large, easy to read LCD display screen and intuitive controls. The menu driven software communicates safely with the vehicle on board computer allowing the user to read and reset fault codes and switch off warning lights.